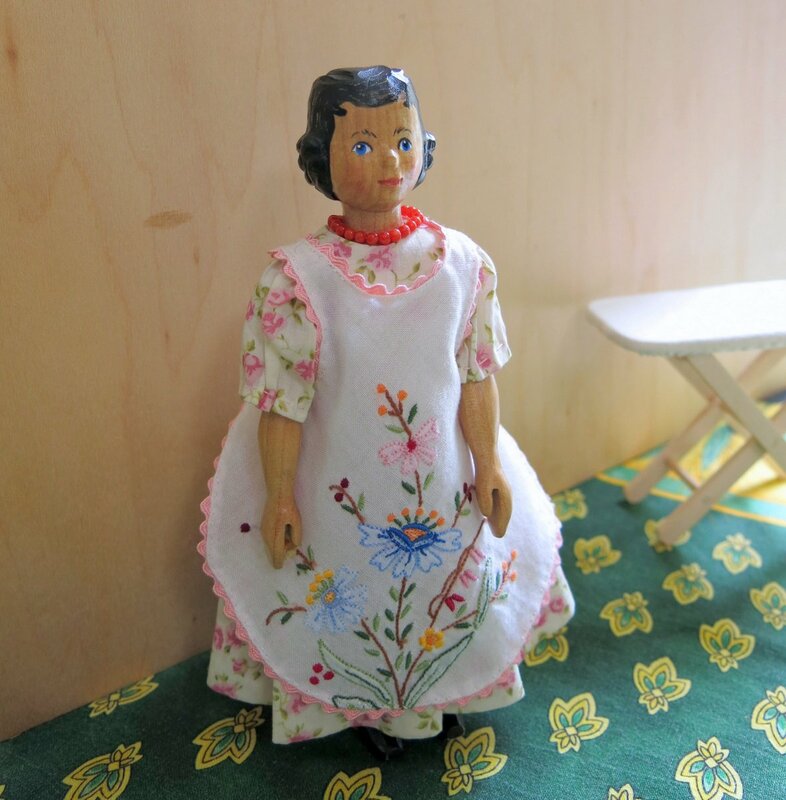 A friend gave the Hittys two nice cotton hankies with embroidered corners…the Quimper Hittys were glad to get the raw material for a new pinafore…here I’ll show you how I made it. Click on any picture below to get into the gallery, and then use left and right arrows to navigate. Choose which Hanky to start with. Constance helps with Ironing the Hanky – it is important to get the surface completely flat to start with. The pattern isn’t quite balanced on the hanky corner but it is positioned to centre the design. I had decided on the light pink rickrack before I actually laid them all out!, then I decided on the darker one on the left of the picture. The shoulder seams are sewn first – match an outside (back) strap with the opposite inside (front) strap, and sew right sides together with an eighth-inch seam. both shoulders sewn and pressed open, time to add the rickrack. I have started the rickrack at a lower corner, but do it however you like. Keep sewing, loop the rickrack through the armhole when you need to, and don’t worry if it looks like it is turning into a big snarl. Keep sewing! This pinafore took about thirty inches of rickrack. I don’t cut the rickrack until I get to the end, because I am never quite sure exactly how much I will use, and I don’t want to waste even a centimeter of the baby rickrack which is pretty old and not available around here. When the rickrack is all attached, fold it around to the reverse side of the pinafore, and topstitch using backstitches. On the home stretch! Pretty much all of the edges are on the bias, so they won’t fray, but you do have to be careful while sewing that you don’t stretch the edges out of shape. Constance helps with the final pressing – this will help the rickrack lie flat around the armhole and neck curves. Rose demonstrates how to put it on, while Min casts hints about the second Hanky. Constance adjusts the straps in the back. We hope you have fun sewing for Hitty this week! Beautifully done! Thank you for sharing – I always enjoy your tutorials. Thank you very much Martha – I have fun doing them! I hope they are helpful to anyone wanting to try! Lovely tutorial, Quimper Hittys! I think half the fun is seeing the girls busy at whatever task is at hand – but love the results, too. Thanks! Half the fun for me is finding ways for the Hittys to help! Hankies are such a nice size for Hitty-sewing…and Hittys always so appreciative! Dear Tottie – you are acquainted with the giver of the Hankies – I plan to show her tomorrow! And in fact this is based on a human-sized apron pattern so you could! Rose looks lovely in her new pinafore, I’m sure she appreciates all the work that went into it. Can’t wait to see Min in the second one. It will be fun making something out of the second hanky! Love this tutorial thank you! It looks like a lot of fun and so pretty as well. It was fun – especially when the rickrack looks like it will end up a horrific snarl, and then it all comes out right at the end! lovely!! Thank you. the Country HIttys LOVE pinafore aprons (much like their human). We will be raiding the hankie stash to come up with some very soon!!! Yay! Hanky Pinafores for all! Once again, you have presented us with a lovely step by step tutorial of fabric loveliness. Thanks for taking time to do this…and finding ways for the Hitty girls to help out! The result is beautiful. You are welcome – I am just trying to keep the Quimper Hittys pacified, but it is always good to hear that Hittys in other households may benefit too! The Pinny is so pretty and it Hitty Rose looks darling in it.. Thanks for the tutorial. It looks simple but i am sure it isn’t. It is pretty simple, though maybe if you aren’t used to hand sewing it might take a little extra patience!